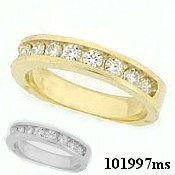 14k Gold CZ/Cubic Zirconia 10 Stone Channel Band Ring HEAVY! Stock #101997:14k White or 14k Yellow Gold... 10 Round CZs in a Gorgeous Channel set, Anniversary Band... 1 Carat total weight, Beautiful, Top Quality Russian Cubic Zirconia! Nice! Contemporary style ring !!! Approx 6 grams and 4.8mm wide!